And as I sat at home last night boiling a roast, my mind turned to thinking about the the two sayings and how they sum up what it’s like to be here in Galway at this time of the year. 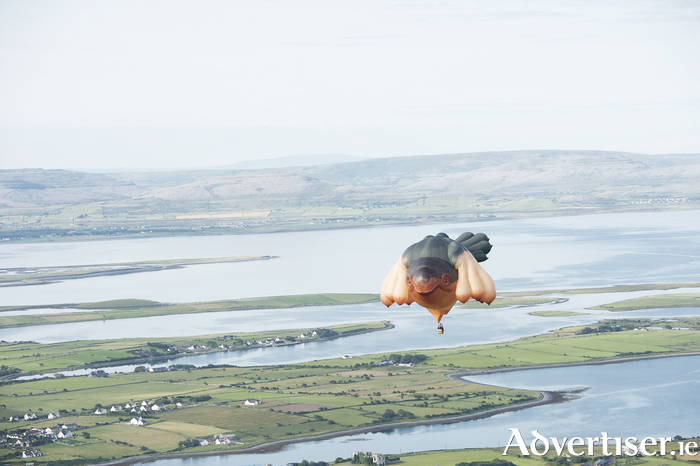 If a multi-titted parrot pretending to be a whale flew above Cork or Dublin, they’d shoot it down. Here in Galway, they just look up at it and say “now where was I, yes in this post dystopian universe, my new novel is blah blah blah.….” Where else in the world would you get a few thousand people to sit in a tent listening to an artist that only a tenth of the audience had heard of. This is Galway. In July, When the rest of the country wants to be here, to be us. But we know that really this is Galway all the time. A sort of madness, a craziness. A place where stuff happens. All the time. As the massive parrot flew above the city, the president of Germany was being conferred with a doctorate in the university. Any one of the two events would be game changers for other towns around the country. In Galway, we just lap it up. This weekend, Liverpool play in town, a few hours later Derry play Galway for a place in the last stages of the All-Ireland, a few hours later again. Kodaline play a sell out gig in the Big Top. This is Galway. Crazy, colourful, busy, always busy and able to take things in its stride. No great fuss. It’s the Galway way. And it is that attitude that will carry us to the Galway 2020 Capital of Culture title. Because we do culture like no other city our size. We take culture like sport and music and politics and drama and we throw it all into a blender and it comes out maroon and white forever. At the opening of this week’s Galway Arts festival, City CEO Brendan McGrath spoke with passion about how Galway will win this award and of what it will mean to us. It is bloody marvellous to hear such commitment from the City Council, dragging together all the strands that make this city the best place to live and work in Ireland. This week bookmakers made Galway favourite to win the award at odds of 15/8 just ahead of Dublin at 2/1. But favouritism is a dangerous thing ‘cos it leads to complacency and notions and showboating. And Galway can afford none of that if it is to win. The way good teams beat lesser teams on any pitch is if the good teams play as well as they can so as to emphasise the gulf. Galway needs to do that and is doing that with its SpeakOuts and competitions and forums getting everyone involved. There are less than three months to go. Get to know your culture, get to love it and make it your own. And enjoy the coming week. Get to see the visual arts. Get to the talks, get onto galway2020.ie, enjoy the street spectacles, inhale it all in and live and breathe your culture.